Pop-up Blockers are intended to block unwanted pop-ups (such as advertising) on web sites, but they also can interfere with legitimate functions such as viewing MLS announcements, linked documents (including pdf documents and office links or report links in email or CTI Matchmakers), frame menu items, print dialog screens, web-links to other websites, IDX search screens, tutorial movies or calendars. There are dozens of pop-up blocking utilities; some also are included in anti-virus programs and free Internet utilities. If supported by your software, a shortcut to temporarily disable blocking on an individual web site is to hold down the Ctrl key on your keyboard when you click on the address link to a web site. Browser add-ons and free toolbars (such as Ask.com, Babylon, Crawler, FunWebProducts, InfoAtoms, MyWebSearch MySearch, MySearchResults, My Way Speedbar, Search Assistant, Search Here) or desktop gadget adware (such as WeatherBug or WhenU) may attempt to redirect some browser functions (especially search) through their proxy servers to the websites of their sponsors. This may interfere with MLS functions that open a new browser screen for viewing (such as linked documents and calendars). To view all currently active add-ons: open Internet Explorer > click Tools or Tools icon > click "Manage Add-ons" button > on the left beneath Show, select "Currently loaded Add-ons" > active add-ons display "Enabled" in the Status column of the list on the right. To temporarily disable an add-on: select it in the Currently loaded Add-ons list (see above) > click Disable button > Minimize or Close the screen to test running the browser without this add-on. To remove unwanted or troublesome browser add-ons and toolbars in Internet Explorer: open your Windows Control Panel > select "Programs and Features" or Add/Remove Programs > select the appropriate toolbar > click Uninstall or Remove (see note 1). To temporarily run IE without any add-ons: close IE > open a Windows Command Prompt [in Windows 10, right-click on Start and left-click on "Command Prompt (Admin)"; in earlier version of Windows click Start > All Programs > Accessories >Command Prompt] > type cd\ and press Enter key > type "C:\Program Files\Internet Explorer\iexplore.exe" -extoff [include the "quotation marks"] and press Enter. To re-enable previously loaded add-ons, close IE and then re-open IE. To block all add-ons from running (but leave them installed): close all Internet Explorer windows > open your Windows Control Panel > select Internet Options > click on the Advanced tab on the top right > under Browsing, un-check "Enable third party browser extensions” > click Apply > re-start your computer. Note that Microsoft's Silverlight add-on will not be able to run as long as "Enable third party extensions" is not checked. To re-allow add-ons to run in IE, check "Enable third party extensions" and re-start your computer. To disable all browser add-ons, and reset all IE settings back to their original default: open Internet Options > select the Advanced tab > click on Reset Internet Explorer Settings . To disable unwanted or troublesome browser plugins and toolbars in Firefox: click Tools > select Add-ons > select the add-on name > click on the "Activation" button and select "Never Activate" to prevent the add-on from running. This leaves the plugin installed but disabled. Type about:plugins into the Location bar and press Enter to display the About Plugins page. Each entry in the About Plugins page will have "File:" and "Path:", showing the name and location of the plugin file. Use Windows Explorer to navigate to the folder shown for the plugin you want to remove. Rename the file, such as by adding an X in front of the filename (for instance, npswf32 becomes Xnpswf32). Note 1: If you remove/uninstall a toolbar/browser add-on that was embedded in a free product, you will no longer have access to the free product or feature. To continue to be able to access the underlying product sometimes, temporarily disable the add-on. Note 2: Toolbars may be hidden but still functioning. To view a hidden toolbar, go to the top of your Internet browser and select Tools or View > Toolbars > click to check the desired toolbar. Only the checked toolbars in the list will be visible in your browser. Note 3: Embedded toolbar/browser add-ons may not be listed by their own name in the Windows list of installed programs. For links to free utilities to find and remove Malware, Spyware, and "Potentially Unwanted Programs" such as ad-directing browser add-ons and toolbars, click on "Free Malware and Spyware Cleaners". Note: If the IE menu is not visible, either right-click on a blank area at the top of the browser and select "Menu Bar"; or click on the Tools icon ( ), select Internet Options, and click on the Privacy tab . 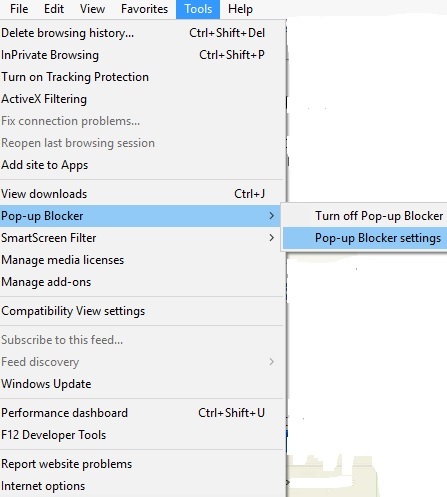 To disable pop-up blocking in IE, select "Turn Off Pop-up Blocker"
To allow pop-ups on approved sites, select "Pop-up Blocker Settings..."
click the Add button. The website *.ctimls.com should appear under Allowed sites. click in the "Address of Web Site to allow" box, enter *mls.com and then click the Add button to include *mls.com in the Allowed Sites. "Settings" to allow pop-ups on multiple sites that you specify. Click beside or drag the "Block Pop-Ups" horizontal slider to Off. Click off of the Advanced Settings menu to close it. Select Tools > Options > Content in the Menu Bar; or click on the Open Menu icon , select Options, then Content. 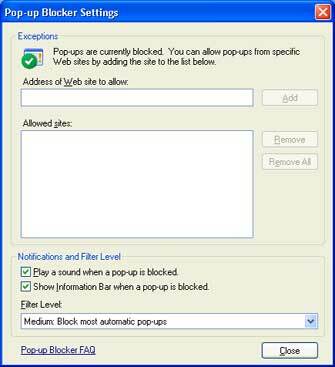 To disable pop-up blocking, un-check "Block pop-up windows" > click OK.
click the Allow button. The website www.ctimls.com should appear under Site with an "Allow" Status. Un-check “Block pop-up windows" (click to see image) . To disable the Pop-Up Blocker in Safari 5 and older: open Safari, select Edit in the toolbar, and un-check "Block Pup-Up Windows." For a keyboard shortcut, hold down the Control+Shift key and press the "K" key on your keyboard. Google Chrome automatically prevents pop-ups until configured otherwise. To see pop-ups that are being blocked on a specific website in Chrome, click the icon in the address bar. To quickly set Chrome to allow you to always see pop-ups for ctimls.com, click the icon and select "Always show pop-ups from ctimls.com". The site will be added to the Exceptions list, which you can manage in the Content Settings dialog (as described below). In the "Pop-ups" section, click "Manage exceptions"
Right-click on the toolbar and un-check Google in the Drop Down menu to temporarily disable blocking pop-ups. In the Yahoo! Pop-Up Blocker dialog screen, select ctimls.com in the "Sources of Recently Blocked Pop-Ups"
Click the Allow button and then the Close button. To stop the Pop-Up Blocking feature in AOL Toolbar, click on the Pop-Up Blocker in the toolbar to toggle it to allow pop-ups . Add the site to the "Safe List" (click "Safe List" tab > Allow Popups for www.ctimls.com > click Allow > X to close). The Ask.com, InfoAtoms, FunWebProducts, MySearch, MyTotalSearch or MyWebSearch toolbar/browser add-ons are embedded in many FREE downloadable products (such as Smiley Central, Cursor Mania, FromDOCtoPDF, My Mail Signature, My Mail Stamp, My Mail Stationary, and Popular Screensavers. The Ask Toolbar is also included in Bandoo Media Products such as iMesh Radio Player Toolbar, Movie Player Toolbar, and Music Box Toolbar. These toolbars may then be activated whenever a new browser window is opened automatically - such as when viewing linked MLS documents (in pdf format), IDX search screens, tutorial movies, or calendars. They also may set "ask.com" as your browser's default home page, and default Search Provider. Note: To configure or temporarily disable the popup blocker if included in the Ask Toolbar, follow the instructions in the previous section (Ask Toolbar with Popswatter). Click the Change/Remove button to uninstall. Click Uninstall to remove (or click Disable to temporarily disable), then click OK.
Click the trashcan icon beside the Ask Toolbar "Enable" option. Select "My Web Search" or "My Total Search"
Close all web browser screens to clear the add-on out of memory. If the add-on persists, re-start Windows. For additional instructions (with video) on removing the Ask Toolbar and/or Ask Homepage as your browser's default homepage, click this link: Help Removing the Ask Toolbar . Starting with version 8, AVG Free Edition includes a LinkScanner component with an "Active Surf-Shield" feature to check every webpage for malicious content before it is opened through a web link. This pre-scanning can greatly slow up or erroneously stop legitimate websites from opening in a new browser window. LinkScanner also includes a "Search-Shield" feature to display a safety rating for search results, including ads, in Search engine screens (such as Google, Yahoo, and Bing). Un-check "Enable AVG Active Surf-Shield"
Un-check "Enable AVG Active Search-Shield"
Click Next until installation is finished. Like Ask.com/FunWebProducts, the "sponsor supported" Crawler toolbar is included with thousands of FREE downloadable products (such as screensavers, wallpaper, animated cursors, desktop weather or traffic utilities, radio & MP3 players, online games, smileys, eCards and IE skins). Enter www.ctimls.com as the "Site host name"
Click Yes to reboot windows. InfoAtoms claims to be "a FREE Browser plug-in that enables you to highlight text on any website and get instant search results, translations, synonyms and more." It sounds useful. However, it also can hijack or block the browser's normal links so it can direct you to advertising supported links. Select "ALLOW ALL Pop-ups from this Site"
You can remove CTIMLS.com from the Black List only after STOPzilla has explicitly blocked pop-ups on the website. Note: If you disable blocking pop-ups in general rather than for a specific website in any pop-up blocker program or toolbar, you may want to re-enable pop-up blocking after you finish using the function that was being blocked. To return to CTI's on-line Menu of Help & Tutorials for CTI Navigator, click here . To go directly to CTI's tutorials for using CMA's in CTI Navigator Desktop (which require that pop-ups be allowed), click here.